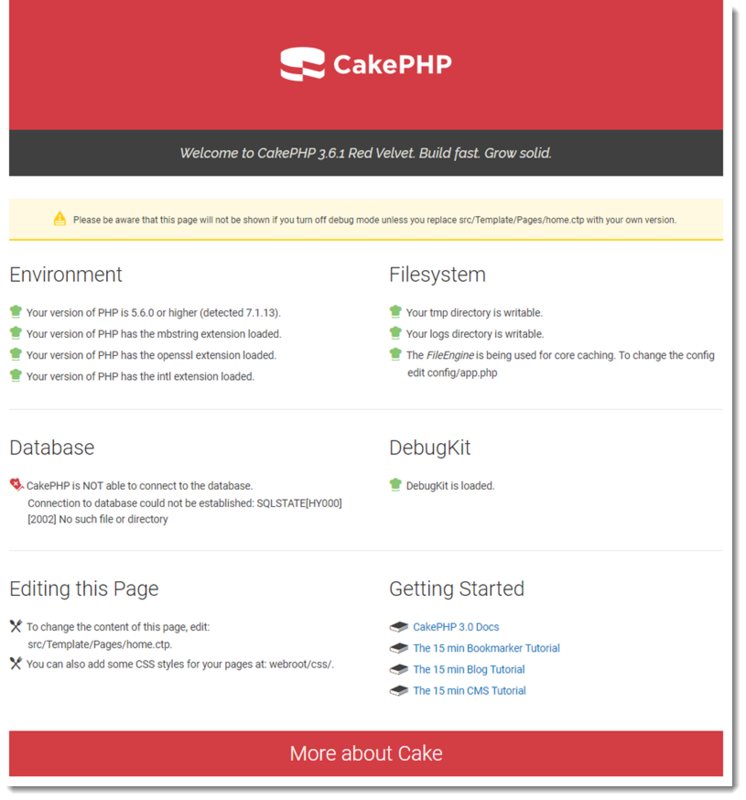 CakePHP is an open source, MVC framework for PHP. This tutorial walks you through the process of generating a CakePHP project, deploying it to an Elastic Beanstalk environment, and configuring it to connect to an Amazon RDS database instance. CakePHP requires PHP 5.5.9 or newer, and the mbstring and intl extensions for PHP. In this tutorial we use PHP 7.0 and the corresponding Elastic Beanstalk platform version. Install PHP and Composer by following the instructions at Setting Up your PHP Development Environment. Composer installs CakePHP and around 20 dependencies, and generates a default project. Create a source bundle containing the files created by Composer. The following command creates a source bundle named cake-default.zip. It excludes files in the vendor folder, which take up a lot of space and are not necessary for deploying your application to Elastic Beanstalk. eb-cake zip ../cake-default.zip -r * .[^. ]* -x "vendor/*"
Upload the source bundle to Elastic Beanstalk to deploy CakePHP to your environment. So far, so good. Next you'll add a database to your environment and configure CakePHP to connect to it. Launch an Amazon RDS database instance in your Elastic Beanstalk environment. You can use MySQL, SQLServer, or PostgreSQL databases with CakePHP on Elastic Beanstalk. For this example, we'll use PostgreSQL. For DB engine, choose postgres. Type a master username and password. Elastic Beanstalk will provide these values to your application using environment properties. Creating a database instance takes about 10 minutes. In the meantime, you can update your source code to read connection information from the environment. Elastic Beanstalk provides connection details using environment variables such as RDS_HOSTNAME that you can access from your application. ~/eb-cake$ zip ../cake-v2-rds.zip -r * .[^. ]* -x "vendor/*"
Choose Browse and upload cake-v2-rds.zip. In addition, you can terminate database resources that you created outside of your Elastic Beanstalk environment. When you terminate an Amazon RDS database instance, you can take a snapshot and restore the data to another instance later. Choose Actions, and then choose Delete. Choose whether to create a snapshot, and then choose Delete. For more information about CakePHP, read the book at book.cakephp.org. Running an Amazon RDS DB instance in your Elastic Beanstalk environment is great for development and testing, but it ties the lifecycle of your database to your environment. See Adding an Amazon RDS DB Instance to Your PHP Application Environment for instructions on connecting to a database running outside of your environment.